As sweet as cinnamon: Out of the Box - block 3 and a winner! It's March already and were does the time really go. Summer has gone and now its getting cooler and I just love it! added your own creativity to the blocks. butterfly's flitting around and a little owl... so cute. You can download Block 3 HERE. And visit Vicki HERE for her block 3.
to our Flckr group, Well Done! button for block 3 in the post for you. Those blocks are very tempting, I might have to keep them for later on as I have too many things I am finishing right now. It doesn't count as a UFO until you actually start does it?? Gorgeous gorgeous - thank you darling Dawn, and congrats to Country Mom! Okay... I seriously need to get started !!! So sweet! I love the owl! Thank you! I love this block. Pretties! .......and I love that Autumn is here...Yay! This is so nice--Thank you. 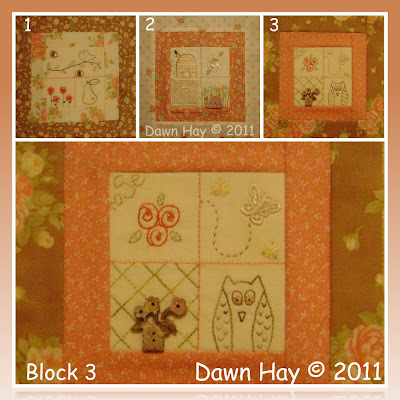 I love the block and I will be getting it ready to stitch as soon as I can. Thanks Dawn for another great block, now to find time to stitch it. You gals have done an amazing job on this! Love it! Thanks a lot ! I love this block ! The 3rd block is very cute. Thank you. What wonderful designs, so very pretty. Thanks to you and Vicki for sharing your talents.